Everything looks good in slow motion. A scene a water balloon bursts, will look more interesting when the plastic gets torn inch by inch, with each and every tiny droplets of water seen seeking the sweet relief. Both scenes would have ended the same way-a plastic tied at one end, lying on the table with a puddle of water surrounding it-but the latter scene would have had more impact. Though, slow motion videos aren’t that awe-inspiring anymore. As the technology improves itself, we are witnessing an era where 240 frames per second are accessible to a normal smartphone user. How about in Tamil Cinema? From the era of combined and repetitive frames in action and song sequences, complete transition to slow-motion sequences is evident. If in the 80’s, the fans would have loved to see their idols somersaulting four times before kicking the goons, the current generation prefers to take time and watch the face muscles of the goon to disfigure or at least, that is what they are being fed. Although some of them are perfectly sequenced and well-placed in the movie (which I will brief again later), most of them just seem to be too clichéd. I can’t help to think that rather than to increase drama in the scene, slo-mo scenes are being placed just to give enough time for the fans to clap and whistle in the theatre. As for me, from the perspective of a regular cinema-goer, who watches for the plot rather than the actor, the purpose of a slo-mo scene is just two. Firstly, to create a small suspense in the scene that might or might not defy usual expectations. Secondly, to provide minute detail that can’t be captured through naked eye. From handful number of memorable mainstream Tamil films, two scenes each from Jigarthanda and Aaranya Kaandam (both films won National Film Award for Best Editing) were the ones that stood out as perfect examples for me. 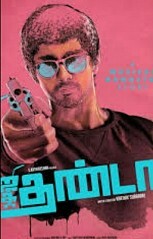 In Jigarthanda, the scene when Oorani tries to force Karthik to leave Madurai, during the physical confrontation, the introduction of “magic present” that later Karthik would use to convince Oorani is indeed a perfect example. The time-length of the scene, the introduction and projectile motion of the falling J**k D**iels bottle, was just enough to create a small suspense among the audience if the bottle would shatter, and did not allow the audience to concretely guess that Karthik will brainwash Oorani. This scene also was well-placed to sustain the suspense, if Karthik would succeed, during the drinking scene. Along the same page, in Aaranya Kaandam, the mix of slo-mo and normal frames during climax scene, where the two gangs meet, gives the audience time to comprehend and understand the fast-flashback, at the same time, captures the minute detail of goriness in the fight. Definitely, juxtaposition of the BGM and the actions elevates the scene to a masterpiece level; nevertheless, the slo-mo served its purpose very well. This article was not aimed to debate commercial or critically acclaimed films. It is only meant to highlight the simple technology which has already been a part of our movies and its usage. Slow motion sequence is just an example of technology. With good literacy among the upcoming technicians, usage of these technologies is not the deal anymore. It is the end product and how well does it contributes to the plot is what matters. This page has information about Why slow motion cinematography?, visitor column.